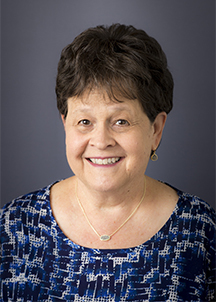 This two-certificate training program targets patient safety, teaches a suicide screening tool, a best practice rapid assessment protocol, and updates emerging practice standards. The course includes 1 hour of content on how to prevent veteran suicide. QPR Gatekeeper Training for Suicide Prevention is the most researched, tested, and evaluated universal suicide intervention program available today. Taught to more than 1.5 million people by 15,000 instructors since 1998, the intervention has been adapted for a variety of settings, e.g., law enforcement, medical, schools, and others. QPR training is supported by dozens of published studies, which include four large random clinical trials – the gold standard for evidence of effectiveness. QPR for Nurses is listed as an approved adaptation of the QPR methodology. 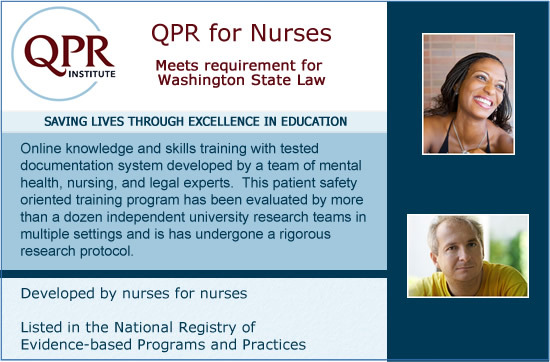 The QPR for Nurses program is intended to prevent suicide not just among patients, but among nurses, their co-workers and family members. This earn this certificate requires a minimum of 6 hours of training and passing a national clinical and content exam. Note: this is not a train-the-trainer program. The institute offers a train-the-trainer program for the Level II QPR Suicide Triage training course embedded in this course, and for the Level III QPRT Suicide Risk Management Training program. A trainer qualified to teach the Level III course can also teach the Level III course. There is currently no T-4-T for this course.